For other uses, see Wah (disambiguation). 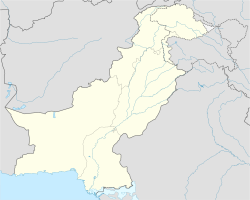 Wah Cantonment (Punjabi, Urdu: واہ کینٹ) (often abbreviated to Wah Cantt) is a military city located in the Punjab province of Pakistan, near Taxila and 30 km (19 mi) to the north west of Rawalpindi/Islamabad. Wah Cantt has the highest literacy rate in South Asia. The name 'Wah' has its roots in the Mughal era with the Mughal emperor Jehangir reported to have coined the name when he was camped at Wah village, originally called 'Jalal Sar' nearby here, en route from a visit to Kashmir. Emperor Jehangir was impressed by the scenery and beauty of that place, so he said "Wah" ('wow') and so the village was named 'Wah' after that exclamation. The Mughal advent had a strong influence on the architecture of the village and whole area which is still visible to date with prominent Mughal sites like the Wah Gardens. This small city has two chartered universities, one medical college, one engineering college and a large number of schools and colleges. Students from Wah Cantt can be found studying at all the institutes of Pakistan and most major universities of the world. Wah Cantt also has the largest number of bicycles in any city in Pakistan. This links the city with its past as, historically, the neighbouring town of Taxila had been a seat of learning for thousands of years. Apart from a large number of private and government schools and colleges, foundations of professional universities have been laid down in the past five years.[when?] F.G Science Degree College For Men, F.G Degree College For Men, Jinnah College, The Mall. Apex Institute of Skills Wah Cantt, Sir Syed College Wah Cantt Wah Medical College, University of Wah – which includes Wah Engineering College & Mashal Degree College for Women, COMSATS Institute of Information and Technology, POF WCC are among the big institutes in Wah Cantt. In the private sector, Zarghoona College for Women, Wah Swedish Institute of Technology, the Scholar Science College, Rawalpindi College of Commerce and Rawalpindi Institute of Technology are local technical education institutes. The City Model Secondary School located in New City Phase-1 is an emerging institute in Wah Cantt and is based in a purpose built building. Zarghoona College Wah Cantt and F.G Post Graduate College For Women are some prominent women's colleges. Government sector schools include the Technical Training Institute (TTI), a center of technical training. Wikimedia Commons has media related to Wah Cantonment. Wikivoyage has a travel guide for Wah Cantt.